Congratulations to the recipients of the 2017 McGill Library Excellence Awards. 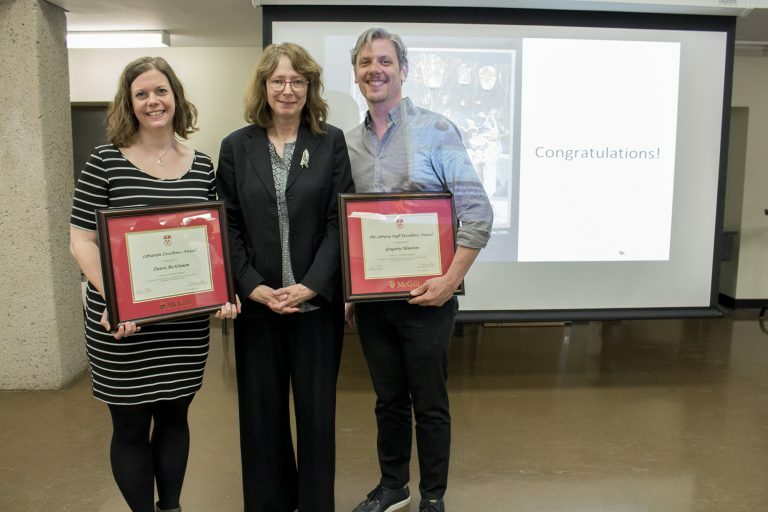 The awards recognize outstanding contributions and exceptional leadership to McGill’s continued success and in advancing the mission of the Library. Digitization and New Media Administrator Gregory Houston, was presented with the Library Staff Excellence Award and Dawn McKinnon, Coordinator, E-Books & Cataloguing, received the Librarian Excellence Award. For almost a decade, Gregory Houston has demonstrated innovative practice, initiative and resourcefulness at the McGill Library. Since 2015, over 500,000 pages have been digitized and made available for research, and in some way each of those pages have been touched by Greg Houston. 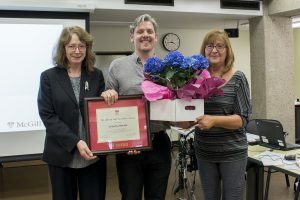 Over the last two years, he has managed to systematically increase digitization by 45% which helped Digital Initiatives complete one of the most ambitious projects ever, the digitization of every thesis in McGill University Library collection dating back to 1881. Greg has been successful at managing large and complex digitization projects and has the perseverance and the creativity to see them to a successful finish. Greg embraces the chance to experiment with new library service innovations. For the past year, Greg’s support and work on the Touch Table Innovation in Service Project for Special Collections, has been exceptional. His technical expertise, his ability to work as a member of a team, and his forward thinking contributions have become essential to the success of this outreach initiative. Since 2008, Dawn McKinnon has placed the McGill Library and the community it serves at the centre of her work. As E-resources Librarian, Dawn has been integral to the improvement of Collection Services processes, particularly concerning order information and e-resources access. With now-legendary proactivity, she designed and facilitated several information sessions for staff in order to share knowledge about Collection Services systems and developed internal communication channels to ensure that everyone remains up-to-date on the status of e-resources, particularly ebook packages and new orders. This transparency for collections practices has been greatly appreciated by public services staff, and has significantly strengthened relations between public services and Collections. A brilliant and clear communicator, she is adept at building trust and creating a supportive and collegial work environment. As a manager, she consistently considers the perspectives of all involved and has taken the lead in making sure the e-resources team has opportunities to excel and take pride in their work. Assuming the role of Coordinator for eBooks and Cataloguing in early 2016, Dawn’s work has significantly increased the speed and frequency in which ebook records are added to the catalogue, and has steered users through various platform migrations. Recently, Dawn willingly took on an extra role and began negotiating and liaising with publishers and vendors. She was instrumental in securing significant package deals with large-scale vendors, and has worked towards establishing beneficial relationships with vendors in order to get the best service for our users. 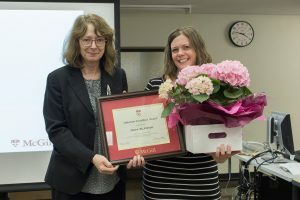 Dawn McKinnon’s engagement with the community extends beyond McGill Library’s e-resources work. Dawn has made significant contributions to the profession. She has served on the OCLC Advisory Group on Metadata Collection Management and is currently on the EZproxy Leadership Group as well as the Canadian Linked Data Initiative Education and Training Working Group. In October 2016, she assumed many of the logistical preparations for the Canadian Linked Data Initiative Summit helping to ensure its success. Her recent research has drawn directly on her Library workflow and communication initiatives with a peer-reviewed article entitled “Notes on Operations: Using Perceptions and Preferences from Public Services Staff to Improve Error Reporting and Workflows” which was published in the April 2016 issue of Library Resources and Technical Services.